George Martinez is running for New York's 7th Congressional District, which includes South Williamsburg, Bushwick, Sunset Park, Woodhaven, Queens, and part of the Lower East Side. 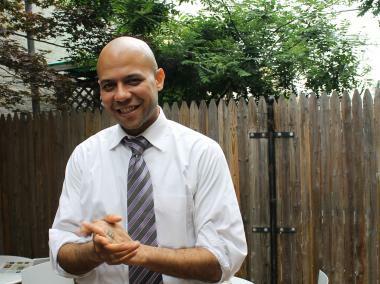 WILLIAMSBURG — His congressional campaign may have little money, but self-proclaimed "Occupy candidate" George Martinez boasts passion, popular appeal, activist experience — and hip-hop skills. "I challenge any other candidate to a battle," a smiling Martinez said in Williamsburg Wednesday, on a break from his campaign as a candidate for New York's newly drawn 7th U.S. Congressional District. Martinez — who is running against longtime Rep. Nydia Velazquez on the Democratic primary ballot in June, along with City Councilman Erik Martin Dilan and first-time candidate Dan O'Connor — unveiled his latest campaign tactic this week: a music video called "Occupy 2.0 All Streets, Bum Rush the Vote." The video, shot during Occupy Wall Street's May Day protests, features the 38-year-old Brooklyn native rapping in a suit on the subway and on the street with demonstrators. "You can't kill an idea," said Martinez about the OWS movement, which led him earlier to record a "hip-hop anthem" with his wife in the fall that has drawn nearly 25,000 views on YouTube. "My goal is to empower a movement of people that will take this action and use it to take over New York City in the next year." That means Martinez — former District Leader for the 51st Assembly District and an adjunct professor in political science at Pace University — also wants an Occupy-inspired mayor, City Council and Congress. He even named his campaign "Bum Rush the Vote" to signify the people-led movement. Martinez, who hopes to represent the congressional district that now includes South Williamsburg, Bushwick, Sunset Park, Brooklyn Heights, parts of the Lower East Side and Woodhaven, Queens, claimed to be the "only Occupy activist on a primary ballot." He said he knew nationally of only one other Occupy activist, Nate Kleinman of Philadelphia, who attempted to run for Congress. "A movement like this is going to hit every level," Martinez said of OWS. "We can't neglect the formal institutions that would otherwise repress us." Martinez said he refuses corporate backing and relies on donations from the general public, emphasizing that on-the-ground activism is as crucial as formal political clout. Currently, he has raised less than $6,000, mainly through donations generated from his website and social media. He claimed he had not completed a detailed filing of his funds since they had just surpassed the $5,000 mark, an amount above which candidates must disclose their campaign contributions. "I think we’ll create the change at the grassroots level," said Martinez, who also runs the nonprofit Global Block, which empowers youth through hip-hop and creative workshops in New York and in developing countries. "But if we had a mayor and dominated City Council, we might have different reactions from police chiefs," he noted. "For example, we might not have tear gas being fired regularly in major cities." Martinez, who has also served as an Arts Envoy for the State Department and has conducted diplomacy trips throughout Latin America, said he had just returned from an 11-week trip in Colombia when he joined Occupy Wall Street. He recalled the transformational experience of speaking before the general assembly crowd in Zuccotti Park about his allegiance to the movement. "I told them, ‘I came back to my city to see real Americans taking over what is already ours,'" he said of his speech. "And people erupted, and I felt inspired." Martinez said a main tenet of his campaign is the push for more affordable housing, noting that his own recent move from Sunset Park to the Bedford Stuyvesant-Bushwick border was spurred by skyrocketing rents. "I think we absolutely need to take over city-owned land," Martinez said of what he'd like to see at hundreds of unused vacant lots across the city. "But right now, if neighbors say we want to take this lot over, they're going to run into a city that’s going to criminalize their actions," he added, suggesting a change to the law. "What starts as a direct action can become a formal empowerment." Martinez, whose mother moved to Williamsburg from Puerto Rico and raised him on her own, said he was the first in his family to graduate high school and college. He said he would also push for better student debt relief if he takes office. Other goals of his campaign include the protection of local schools and hospitals — including Wyckoff Heights Medical Center in Bushwick, which is slated for closure — and reform of the NYPD's stop-and-frisk policy. As for Velazquez — who has held her congressional seat since 1993 — her office confirmed she will be running in the primary but commented little on Martinez as a challenger. "The congresswoman will be on the ballot," said a spokesman for Velasquez. "The congresswoman is proud of her record, but it is certainly [Martinez's] prerogative to run." There is also dissent among some Occupy activists over Martinez's run, admitted Cecily McMillan, a longtime member of the movement and his deputy campaign manager. "I think there's a small minority of purists that believe what George is doing isn’t part of the movement," said McMillan, who is also a master's candidate in liberal studies at the New School. "They wanted the Zuccotti encampments to take over and said, 'We don’t want to participate in the hierarchical societies anymore.' But it’s a small minority." McMillan, who was recently interviewed by Democracy Now after she said she experienced a seizure during her arrest in a March protest, said she felt protesters realized they needed to support one another on multiple fronts. "There was such infighting in the fall," she recalled of protesters' ideological arguments in Zuccotti Park. "Between that and the police brutality we experienced, we realized we can't fight at home. Occupy can be an idea that's transferable to many plains."